Solution-focused memory work recognises each individual as the expert of his or her own life. This gives them the self-confidence, assurance and courage to see one's own future in a new light, and to fashion one's own destiny. aidsfocus.ch was invited by CO-OPERAID to facilitate a training-of-trainers workshop on solution-focused memory work with their partners in Uganda. It was a little strange to be invited to Uganda to facilitate a training workshop on solution-focused memory work – to Uganda, the country that is considered the cradle of memory work in the context of HIV and AIDS in Africa. In the 1990s the National Community of Women living with HIV/AIDS (Nacwola) started working with memory books. The women in Nacwola, who themselves were HIV positive, wrote memory books as a legacy for their children. Communication within the family and relationships with mothers also improved through the writing of books and through the recounting of their story. The good experiences gathered with memory books in Uganda became well-known among experts on the subject. The approach was taken up and further developed in South Africa and made its way to Switzerland via our South partners. 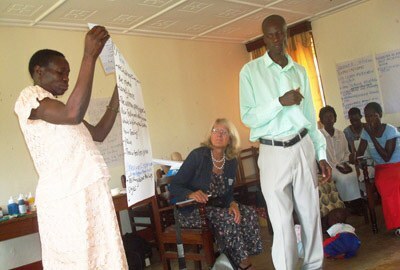 The training-of-trainers workshop on solution-focused memory work took place from the 25th to the 30th of September 2011 in Masaka. It was organised by CO-OPERAID, one of aidsfocus.ch's partners, and supported financially by the Swiss Catholic Women's League, the Swiss AIDS Federation and aidsfocus.ch. 28 women and men from six local organisations took part in the workshop, including NGO programme officers, volunteer workers, women and men who live with HIV and/or have lost one or both parents. Solution-focused memory work also strengthens one of the classical qualities that are contained in memory work, that is to say the ability to cope with life’s challenges. The solution-focused approach assumes that every person has strengths and abilities, which a person can build up on when he or she is seeking solutions. Objectives are developed together, resources identified and a new awareness and self-confidence are developed in the process, in order to proceed towards the ultimate goal. This attitude is also very important for work with memories – for every single person is the expert of his or her own biography. One of the key elements in making the memory book was an exercise with the six windows that provide people with an insight into their own story. The participants drew six pictures of events in their life in their books. Every picture gives an impression of a decisive event in their biography, such as the death of a loved one, being tested positive for HIV or cancer, the first flight to Europe, or the decision to live "openly positive". The author told his or her story to a partner, whilst the latter listened attentively and empathetically asked questions, if necessary. The partner then re-told the story just heard in a strengthening, empowering way, as the story of a strong woman who has made it against all the odds. One of the stories told was that of T., who was thrown out of the house she and her husband had lived in by his relatives after his death. She experienced great hardship for a while as a result. Thanks to her strong will to survive and her training as a nurse she found work again and a place to stay. Now she successfully works to support other disadvantaged women. It isn't the story of sorrow and pain, but rather the story of a strong woman who never gave up. Recording and telling a story, listening attentively and recounting it, and hearing your own story in other words are important and mutually reinforcing elements in the process. This helps those concerned to recognise the issues that give them strength and the survival strategies of their own biographies. They are the experts of their own life. A stimulating exercise with one's life story that is inspired by the solution-focused approach is the exercise with the highlights. Someone asked a partner to choose a situation from his or her life in which he or she was particularly successful. The partner then tried to find out how she managed the feat. Together with the partners, the conversations were consistently steered towards identifying those strengths and resources that were crucial to achieving the success concerned. The exercise aimed to awaken a new awareness – reach for the stars, instead of allowing yourself to be dragged down by your problems. Memory work is like a tree that enables adults and children to discover their own roots, and simultaneously encourages them to grow and cope with life. Jacinta Magera, programme manager with Nacwola, very vividly facilitated the family tree exercise with which Nacwola works, and which was developed with polygamous relationships in the Ugandan context. Working on the family tree gave participants an impressive insight into the relevance of the multifaceted and complex relationships and dependence of Ugandan families and tribes. Children belong to the father's family, no one questions this fact. Children and youths gain an identity by belonging to the father's family, an identity that is very important when it comes to marriage. They are the only relatives the children have. Jacinta told the participants that, whilst she was sitting in hospital by the deathbed of her late husband, his relatives emptied the whole house of its entire contents, leaving just the curtains. Even though she was abandoned by those relatives and was left to fend for herself, as an HIV-positive mother with four children, she continually emphasised to her children the importance of getting on with the relatives: they are the only ones they have. Solution-focused memory work looks specifically at strengthening one's own self-identity and at "living positively" with and despite the illness. Strengthening the self may reduce "self-stigmatisation" and give the person concerned the courage to openly stand by his or her HIV status. Self-stigmatisation is a key factor that impedes one's own development and simultaneously prevents a reduction of stigmatisation and discrimination by others. Experience gathered in Uganda, Togo and Haiti has shown that memory work helps people who live with HIV to become more open in relation to their status – first within their group and their family, but also in the community at large. Working with one's reminiscences remains relevant today, in a time when antiretroviral medicine is available even in remote areas of Uganda, as it enables people who are HIV positive to live a long life, and simultaneously helps them to cope with life. In her sixth picture Francesca drew herself cheering, with her arms up in the air. "Ever since I have publicly stood by my status I have felt free and happy. I live positively." Francesca recounted how she put 50 Ugandan shillings of the little that she earns every month aside for transport to the clinic for her monthly health check and to pick up her medicine. The next important item in her budget are the school fees for her children, who she has to look after alone and for whom she wants a promising future. What money remains should suffice for her food. She proudly showed me her two memory books, one that she had already written for her son, and a new, solution-focused memory book, which she is writing for herself. At the end of the workshop every participant had a memory book of his or her own, and every organisation had elaborated a plan, including aims and concrete steps for how they want to implement what they learnt in the framework of their organisation, for the period through to the 30th of September 2012. In this context, too, the training-of-trainers workshop was oriented towards solutions and to the future. The success of the workshop will be seen in a year, with the implementation of concrete solution-focused memory work activities.